This is one of a set of 7 hats for a special order. The order was for 4 child/teen sized hats, but then I had bits of yarn left over so I made 3 doll-sized hats to include. My customer is amazing: these are part of her Christmas shopping! Gertie update: Thank you all for cheering Gert on! She says thank you too, only it sounds more like "purrrrrr". We have big news: yesterday she ate her first food in about 3 weeks! It was only a teaspoon, but it's a step in the right direction. She didn't repeat until this morning, and now isn't interested again. We're going in for her check-up tomorrow. Hopefully we'll keep taking small steps in the right direction. i seriously love your hats girl. well done. blow up a balloon and paper mache it with a wide tube at the bottom (duct tape roll)? couln't be that hard, right, wait, you've already done that for the little purses (http://zhinkadinkadoo.typepad.com/zhinkadinkadoo/2006/02/fabric_mache_ba.html). Sounds like a fun backyard project...if it ever warms up here maybe I'll try. I love the hat, that wool is beautiful. I love those hats (I still think of them as birdie-monkey hats, although wood sprite is a great name for them, too). 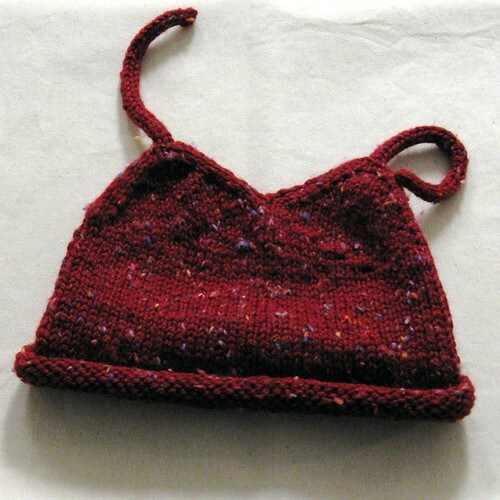 That red tweedy yarn is just perfect. Go Gertie! For some reasons the Gertie message dated June 8 just showed up in my bloglines along with this one (and this one just showed up today, June 17). Crazy Typepad. Glad she's doing better--she's lucky to have such a caring owner. Grow your own! If you enjoy gardening, but have been hesitant to embrace organic gardening because it sounds too complicated.